Thanks for your amazing auditions!! This was a DIFFICULT show to cast, as there were SO many great reads and amazing voices!! Yaaaaaayyyyy!! I am super excited to get started, and will be working on the rehearsal schedule this week. We WILL be doing a read thru on Thurs., Feb. 7 at 7:00 pm in the auditorium, and the first music rehearsal will be Sat., Feb 9 at 10:30-1:00 in the auditorium. I am still waiting for the contract for the rights, so will have to run off the librettos to use until we can get them…. We will be doing all music rehearsals in Feb., with maybe some choreo. starting as the numbers are learned. When you know which numbers you are in, please try to learn them as soon as possible, so we can get the choreo started. You can find most of the numbers on YouTube…. Blocking will be in March, as well as putting it all together, and then continue to polish in April. Since we have Feb. break and April break with no rehearsals, I expect everyone to do A LOT on their own to make this show fabulous!! We also don’t have the auditorium in May, but for a few times, so I am planning on having the show ready to go by the end of April…..with tech, etc. happening then. We will be using a lot of roll on flats, with set pieces, so they can be stored by the side and not get into the way. Anywho—–here is the full cast list!! Thank you all for accepting your parts!! This is going to be such fun, no matter what part you are……AND remember……EVERY part is IMPORTANT to the story!! This show is a perfect example of ensemble work…..we ALL need to work together!! Love you all! Have a great day!! The auditions for the musical, The Drowsy Chaperone, are on Sunday, Jan. 27 at 3:00pm at The Cannon Theatre, 410 Great Rd. and on Mon. night, Jan. 28 at 5:30pm in the high school auditorium. Be prepared to read cold from the script. Prepare 32 measures of a song from a musical. Email scannon@thecannontheatre.org for a specific audition time! The Fine Arts Boosters of Littleton (FABL) is a 501(c)3 charitable organization focused on enhancing the arts programs within the Littleton Public Schools. FABL will be hosting its third Annual Members Meeting on Monday, November 5th from 7:00-8:30 PM in the Littleton High School Library Seminar Room. This meeting is open to the public. All parents with children involved in the Littleton Drama, Band, or Choral programs are strongly encouraged to attend. Please see the attached PDF document for more detail on the meeting and consider volunteering some of your time to this parent-run organization! Announcement time! We are happy to officially announce that Shawn Cannon from the Cannon Theatre will be directing the play and the musical this year at the high school. Auditions start next week (see below for details) Shawn is not expecting the kids to come in having practiced a part. They will be doing a “cold read” in groups. However, there will be six copies of the script in the LHS library that they can go in and look at if they want to. Since Shawn was just barely hired, the details of the performance and practices will be worked out on Monday after a meeting with Dr. Harrington. But we wanted to make sure that you at least know when the auditions are. Thank you for your patience and support as we welcome Shawn to our fine arts community! Please contact Shawn @ scannon@thecannontheatre.org for an audition time! Dress nicely for your singing audition. This tells the directors that you care about being in the show, and when you look nice, you feel and sound better. There will also be a dance / movement portion to the audition, so bring a pair of comfortable shoes, and clothing that you can move around in comfortably. I’m excited to announce that the spring musical will be the classic, “Hello, Dolly!” It’s currently playing on Broadway with Bette Midler in the title role (Bernadette Peters takes over in mid-January!) This is an iconic musical with a slew of roles for everyone! I’m looking forward to co-directing this show with Julia Fiske Deter (who just choreographed “Annie” at the middle school). Julia will also handle the choreography for this show, and I will be the music director. Tryouts will be the night we get back in January (Tuesday January 2nd), so I’m making the singing materials available now. Also, the script is uploaded so that you can read it ahead of time. It doesn’t matter which time you sign up for, each hour will be the same! It’s just a way to see everyone in a more organized manner, and keeps you from staying more than an hour on this night. If you can’t figure this out, you can just show up to one of the time slots, but you will be seen as time permits. You will sing one of the two song choices (though you should prepare both of them, just in case), and participate in a movement call with Julia. After the hour, you’re done for the evening. I will post a callback sheet (on the LHS Drama website – www.littletonhighschooldrama.com) by the end of Wednesday. Everyone will not be called back – just those we need to see more from. And remember, not being called back does NOT mean that you won’t get a featured role, it just means that we saw what we needed to see on Tuesday. Email me with any questions – I’m looking forward to working with you on this fun musical! Tryout materials can be found here. – You will sign up for one of three sessions via signup genius – everyone will SING and everyone will DANCE. Will there be a spring musical? Absolutely. Is the spring musical changing from Wedding Singer? Yes. Do I know what it is changing to? Not yet. When I know, i will pass the information to Mr. O’Neill, who will upload it here on the website, along with specific tryout materials. Who will be directing it? Me, and an adult assistant director / choreographer. I’m looking forward to working with everyone on it! Are the tryout dates, or the production dates, changing? No. Tryouts are scheduled for the evenings of January 2 and 4 in the high school auditorium. There will be a couple of rehearsals in January (dates and times TBA), and a read through on Sunday evening at 7pm on February 4. Rehearsals will be (mostly) Sundays, Tuesdays (some Wednesdays) and Thursdays for February and March. Availability and attendance will affect casting: if you can commit to the show, come join us! If you have conflicts (from athletics to jobs), please consider in advance whether you can commit to the show, as it’s only fair to those who will make the time. Good Friday is Match 30 (no rehearsal) and Easter is April 1 (no rehearsal) but there will be some type of rehearsal on March 31. Performances are Friday April 6 @7:30, Saturday April 7 @7:30, and Sunday April 8 @4pm. If you have other questions about the show, you can email me. Thanks! Here is the rehearsal schedule for “Durang / Durang.” JulieAnn Govang will be directing, and Michelle Murphy will be your production stage manager. As this production is a series of shorter plays, listing your conflicts at the tryouts is very important, as each night will only have certain plays rehearsing, and absences will be very harmful to the success of the plays that you may be cast in. JulieAnn is also still looking for student directors, so if you are interested in that, email her directly. Student directors will also have the option of scheduling extra rehearsals on their own with their cast (in addition to these listed). The High School Play will be “Durang/Durang”, a series of one-act plays by satirist Christopher Durang. The High School Musical will be “The Wedding Singer”! 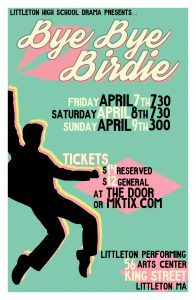 LITTLETON, MA: Flash back to the early 1960s and spend some time with Littleton High School Drama as they visit mid-Century Ohio in the classic musical “Bye Bye Birdie!” Performances run April 7 and 8 at 7:30pm; April 9 at 3:00pm, in the Littleton Performing Arts Center at 56 King Street. Tickets are $14 reserved; $12 general admission, available at the door or through MKTIX.com. Sponsored by ArtsNashoba, LHS Drama’s final dress rehearsal on April 6 at 7:00pm is an Autism/Special Needs-friendly performance. It is specifically adapted for this special population, their families, their educators and caregivers. Performances are designed and intended for those who are on the autism spectrum or who have other sensory issues. At this performance, the theater environment will be altered, providing a safe, sensory-friendly, comfortable and judgment-free space that is welcoming for all. Reservations for this show must be authorized by ArtsNashoba’s AF Coordinator, Bonnie Marchesani by calling (978) 842-1255, or via email at info@artsnashoba.org. Conrad Birdie, the biggest rock and roll star of the 60s, has been drafted! Aspiring songwriter Albert Peterson is convinced he can make his fortune and marry his girlfriend (and secretary) Rosie if they get Conrad on the Ed Sullivan show. All he has to do is give a girl one last kiss goodbye before he joins the ranks. Easy – in theory. Of course, Albert’s mother will do anything to break Albert and Rosie up. Mr. MacAfee wants NOTHING to do with young delinquent rock stars. Add in Sweet Apple, Ohio high-school steadies Kim and Hugo, a plethora of star struck teens and one very angry Father, and hilarity ensues! A musical inspired by the phenomenon of Elvis Presley and his draft notice into the Army, “Bye Bye Birdie” is composed by Charles Strouse (“Annie,” “Rags,” “Applause”), with lyrics by Lee Adams and libretto by Michael Stewart. It is a very family-friendly show with music that will have you tapping your toes throughout. Featuring nearly 50 students from Littleton High School and Littleton Middle School, “Bye Bye Birdie!” runs April 7 and 8 at 7:30pm; April 9 at 3:00pm, in the Littleton Performing Arts Center at 56 King Street. Tickets are $14 reserved; $12 general admission, available at the door or through MKTIX.com.